SDI has made sure that every market aspect is met, be it the upgrading in designing or the new developments and techniques introduced in industry. Hence we have CAD jewellery designing course along with manual jewellery designing. 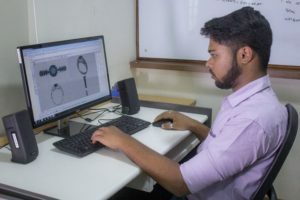 In this course we teach students the 3D designing of jewellery. We first teach them sketch using pencil and paper with rendering which is the 2D designing and then transfer into the system making it 3D design. Every minute details are done using a software Rhino. Rhino is the latest and widely used software for CAD designing all over the industry. We timely update the software as and when the new versions are available. This course helps the students to get the details of the whole piece they designed which in turn help them understand the technical mistakes they make while designing. This 3 dimension in designing give a feeling of manufacturing the product urself. 2D Designing of jewellery on system.